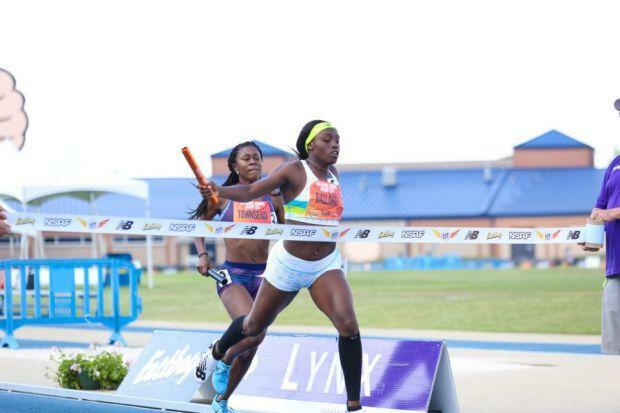 Two Pennsylvanians won national titles in a busy final day of action at New Balance Nationals Outdoor from Greensboro, North Carolina. Miles Green kicked to the 400-meter hurdles victory, while Payden Montana finished off a picture perfect outdoor season with a shot put national title. We break Day 3 action below (with other meet links). Endings don't come sweeter than the one Miles Green got on Sunday. 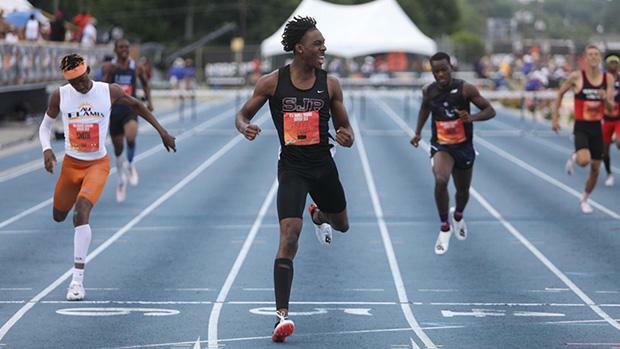 The Saint Joseph's Prep grad and Virginia Tech recruit ran a near-perfect race to cap off what has been a great career with a national title in the 400-meter hurdles. Green went 51.07 to earn the win in a close fast section of the event. Top-seeded Akeem Lindo got out fast and made up the stagger on Green, but the Pennsylvanian stayed in the race. He closed very hard in the final 100 meters and pulled away coming off the final hurdle and earned the victory in a new US#1 time. It was also a PR by over a second for Green, who ran 52.30 at the Penn Relays. Payden Montana was unmatched in the shot put this season in Pennsylvania. On Sunday, the Berwick proved she was the best shot putter in the nation, adding a national title to what has been a dream senior season for the Penn State recruit. Montana threw 49-11.75 to win a very close Championship Girls' Shot Put competition. Second and third place both threw 48-11.75, but it was Montana's second throw that stood atop the leaderboard through the competition. This season, Montana won her second straight PIAA Class AAA shot put state title, as well as her first AAA discus championship. She was third on Saturday at NBNO in the disc. At the state meet, she launched a throw of 51-00 in the shot put, the furthest outdoor throw in state history. Sunday was the icing on the cake for one of the greatest throwers the state has ever seen. The weekend started as a strong as it could for the ladies of Neumann-Goretti, who won the national title in the 4x800-meter relay in the second fastest time ever clocked by a PA team. On Sunday, the Saints closed in a big way, picking up more All-American honors. Sydni Townsend went sub-one minute in the 400-meter hurdles and came away with a solid third place finish in the Championship section of the event. The Pitt recruit went 59.58 for bronze and All-American status in a very close fast section. Her previous PR stood at 1:00.19 for the Penn Relays. Later in the day came the 4x400-meter relay. The Neumann-Goretti girls took a close second to Western Branch. The team of Dasia Wilson, Mykala Perry, Kami Joi Hickson, and Townsend ran 3:42.07, the fastest time by a PA squad likely since William Penn's all-time state record of 3:39.70 from 2001. Talitha Diggs finished up a great sophomore season over the weekend, capping it off with an All-American run in the 200 meters. The Saucon Valley rising junior went 23.97 in the finals to finish fourth in the country and earn All-American status. Earlier in the day, Diggs dropped a 23.90 in the prelims of the 200, the second fastest PA time this season (only Thelma Davies state record 23.10 was faster). Diggs was second in the AAA 200 meters at the state meet. On Sunday, she solidified herself not only as one to beat in PA next season, but also a major threat on the national scene as she moves into her junior year. Caleb Johnson posted a big PR and was the top Pennsylvania finisher in the Championship Boys' Pole Vault. The Germantown Academy rising senior cleared 16-01.25 for eighth place in a loaded field that saw the winner KC Lightfoot cleared 18 feet. Johnson cleared 16 feet for the first time indoors, taking second at indoor states, but Sunday was his first time over 16 feet outdoors. It's also an inch and a half all-conditions PR. Johnson is the top returner in PA for next season. Breana Gambrell closed out her prep career with a fourth place finish in the Championship Girls' Long Jump. The Athens Area graduate and future Penn State Nittany Lion jumped 19-06 to earn All-American honors. Maya Evans of Colorado jumped 20-01 for the win. Palisades' Lydia Bottelier cleared 5-07 to place tenth in the Championship Girls' High Jump. Bottelier was one of 11 girls to get over 5-07, but on attempts, she took tenth along with four others. Seneca Valley's Zach Gehm narrowly missed the final in the Championship Boys' Discus. The senior came away with a ninth place finish and a best throw of 175-11. In the heptathlon, Oakland Catholic's Jayla Ellis scored 4,582 to finish sixth and Cheltenham's Brianna Smith scored 4,508 to take ninth in what was a busy weekend for the pair. At the USATF Junior Outdoor Championships in Bloomington, Indiana, Austin Kratz and Sayyid Saunders turned in strong performances in the 200 meter final. Kratz placed third in 20.75, just missing a spot on the World Junior squad bound for Finland in July. Kratz got out strong, but the speed of Ohio State's Eric Harrison and junior college national champion Khance Meyers proved to be a bit too much down the stretch. Harrison won in 20.44 and Meyers was second in 20..62 (the top two make the team). Saunders was sixth in 21.31. Dalton Hengst, of York, PA, palced fourth in a competitive men's 1,500 meters. Hengst clocked a time of 3:50.70, just missing a spot on the World Junior team. Notre Dame's Yared Nugese won in 3:49.65, while Oregon's Cooper Teare was second in 3:49.88.